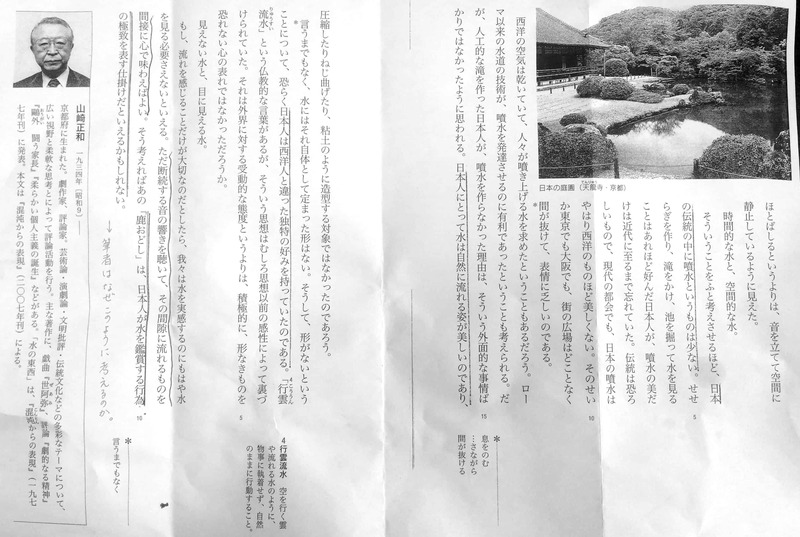 The other day I received from my Japanese teacher an interesting article by Yamazaki Masakazu 山崎正和 comparing garden styles, and in particular the attitude towards and presentation of water in Japanese and European gardens (page 1, page 2). The author’s list of achievements is long, various professorships, dramatist, literature critique, recognized as Person of Cultural Merit, just to name a view. I was looking forward to an interesting and high quality article! The article itself introduces the reader to 鹿おどし Shishiodoshi, one of the standard ingredients of a Japanese garden: It is a device where water drips into a bamboo tube that is also a seesaw. 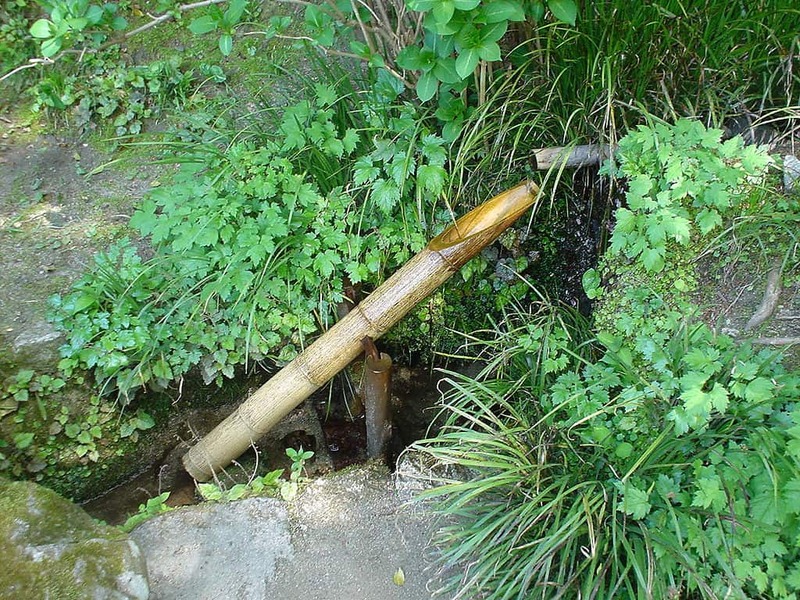 At some point the water in the bamboo tube makes the seesaw switch over and the water pours out, after which the seesaw returns to the original position and a new cycle begins. The author describes his feelings and thoughts about the shishiodoshi, in particular connects human life (stress and relieve, cycles), the flow of time, and some other concepts with the shishiodoshi. Up to here it is a wonderful article providing interesting insights into the way the author thinks. 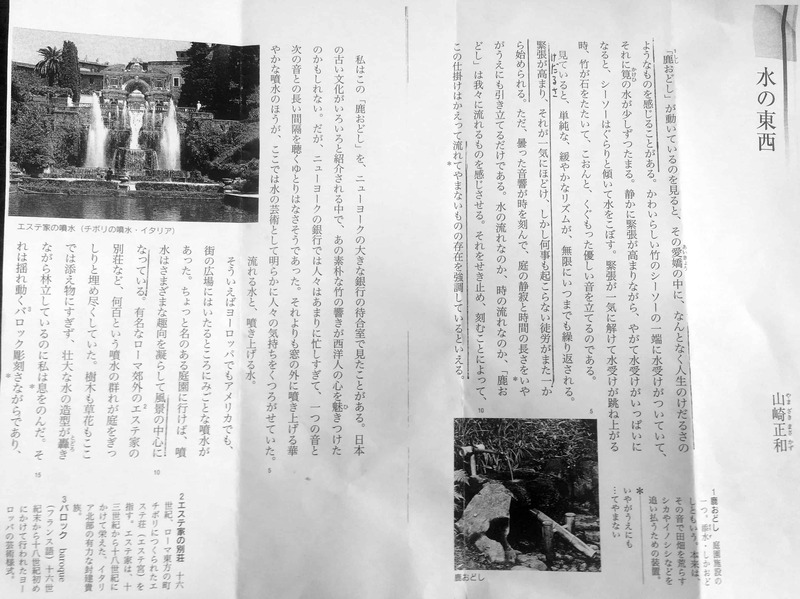 Unfortunately, then the author tries to underline his ideas by comparing the Japanese shishiodoshi with European style water fountains, describing the former with all favorable properties and full of deep meaning, while the latter is qualified as beautiful and nice, but bare of any deeper meaning. I don’t think that this separation, or this negative undertone, was created on purpose by the author. A person of his stature is supposedly above this level of primitive comparison. I believe that it is nothing else but a consequence of upbringing and the general attitude that permeates the whole society with this feeling of separateness. Repeatedly providing sentences like “Japanese people and Western people have different tastes..” (日本人は西洋人と違った独特の好みを持っていたのである). About 10 times in this short article expressions like “Japanese” and “Westerner” appear, leaving the reader with a bitter taste of an author that considers first the Japanese a people (what about Ainu, Ryukyu, etc? ), and second that the Japanese are exclusive in the sense that they are set apart from the rest of the world in their way of thinking, living, being. What puzzles me is that this is not only a singular opinion, but a very general straight in the Japanese media, TV, radio, newspaper, books. Everyone considers “Japan” and “Japanese” as something that is fundamentally and profoundly different from everyone else in the world. There is “We – the Japanese” (and that doesn’t mean nationality of passport, but blood line! ), and there are “They – the Rest” or, as the way of writing and and description on many occasion suggestions, “They – the Barbarians”. A short anecdote will underly this: One of the favorite TV talk show / pseudo-documentary style is about Japanese living abroad. That day a lady married in Paris was interviewed. What followed was a guided tour through Paris showing: Dirt in the gutter, street cleaning cars, waste disposal places. Yes, that was all. Just about the “dirt”. Of course, at length the (unfortunately only apparent) cleanliness of Japanese cities and neighborhoods are mentioned and shown to remind everyone how wonderful Japan is and how dirty the Barbarians. I don’t want to say that I consider Japan more dirty than most other countries – just the visible part is clean, the moment you step a bit aside and around the corner, there are the worst trash just thrown away without consideration. Anyway. To return to the topic of “Us and They” – I consider us all humans, first and foremost, and nationality, birthplace, and all that are just by chance. I do NOT reject cultural differences, they are here, of course. But cultural differences are one thing, separating one self and one’s perceived people from the rest of the world is another. I repeat, I don’t think that the author had any ill intentions, but it would have been nicer if the article wouldn’t make such a stark distinction. He could have written about Shishiodoshi and water fountains without using the “Us – They” categorization. He could have compared other water installations, could have discussed the long tradition of small ponds in European gardens, just to name a few things. But the author choose to highlight differences instead of commonalities. It is the “Us against Them” feeling that often makes life in Japan for a foreigner difficult. Japanese are not special, Austrians, too, are not special, nor are Americans, Russians, Tibetans, or any other nationality. No nationality is special, we are all humans. Maybe at some point this will arrive also in the Japanese society and thinking.